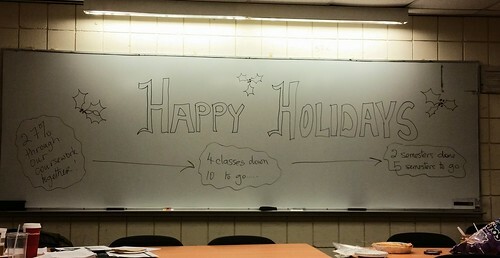 A white board with the words "Happy Holidays" on it, along with a breakdown of how much of the doctoral program we have completed and how much is left to go. When our cohort came back from lunch on this past Friday, we were greeted with this sign, written by one of our cohort members. It was the last day of our face-to-face classes fro the semester and a well-received message as we all staggered back into class, many of us looking hungover--not from alcohol intake but just from the intellectual exhaustion of the last few weeks as we crammed to write our papers while also trying to do our regular day jobs and of course, live our lives. But I post this as today's photo because by the time it is posted, I shall be done with my papers for the semester and because of good planning with my wife, I have very little left to do in terms of the holidays besides to enjoy them. So I'm looking forward to the downtime with the semester officially over.